On an unseasonably warm day in late October, I drove to the end of a dirt road in Richmond and met Lars Whitman, the sole proprietor of Silo Skis. In the driveway of the off-the-grid home he shares with his wife and two children, Whitman parks a white 8-by-16-foot trailer that serves as his custom ski-building workshop. Most of Whitman's customers order Alpine skis via the internet, by filling out a form detailing their chosen specifications. I was in the other camp: I had come to make my own skis under Whitman's watchful eye. Custom skis make up a tiny fraction of the ski market, which is dominated by a dozen brands including Elan, Rossignol, Salomon, Head and Völkl. But the category is growing. In 2005, Eric Edelstein began keeping track of custom builders from his home in Norwich. He started with a list of 10. Now his website, exoticskis.com, has information on more than 380 custom ski makers around the world. "I liken it to the craft beer movement," he said. "In the old days, every mountain valley in Europe had its own ski builder. It's come full circle now. There are many in Colorado. And in New England, we're getting some, too." In Vermont, the modern era of custom skis probably began with Vin Faraci of Hyde Park, who founded WhiteRoom Skis in 2009. He started by building skis for himself and some friends and family members. Then he got bombarded with questions about his skis while out skiing. "It just got to the point where I thought, There's nobody in Vermont doing this, so maybe there's a small niche," said Faraci. "So I decided to try it out." He figures he's sold about 80 pairs of skis since then, moonlighting after his regular job as an athletic trainer. Whitman, 43, was raised in Brattleboro and learned to ski at Hogback Mountain and Maple Valley, both of which are now defunct. After college, he worked as a carpenter in Chittenden County for more than 10 years. Wanting to avoid the physical toll of home building, he switched to making guitars. In 2012, Whitman combined his passions for skiing and building in a six-month apprenticeship with a ski builder in Idaho. 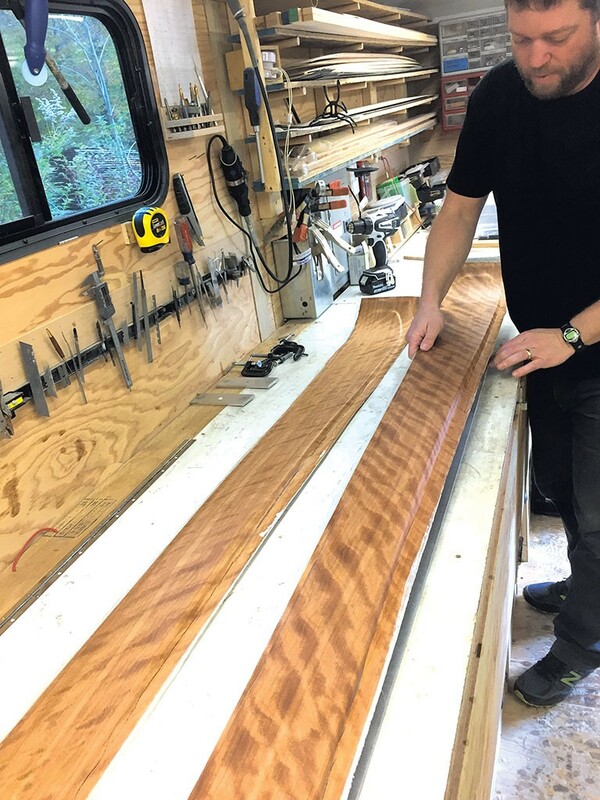 When he returned to Vermont, he built guitars with Adam Buchwald of Circle Strings in Burlington, devoting a section of their workshop to tinkering with skis. Whitman left Circle Strings at the end of 2015 to found Silo Skis. 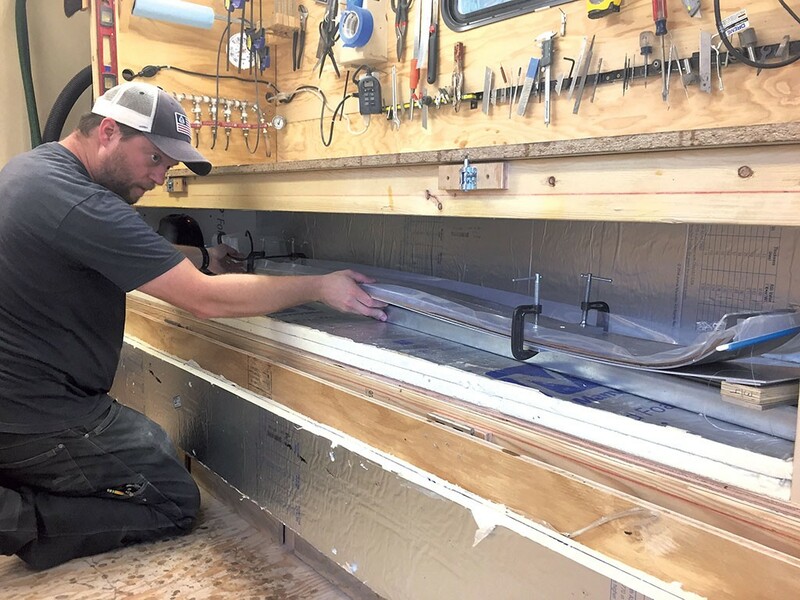 WhiteRoom and Silo are the only two commercial ski builders who fabricate metal-edged skis in the state, but there are larger Vermont-based builders, such as J Skis, HG Skis and Renoun, that outsource their manufacturing to Québec. Operating a niche within a niche, Whitman is one of maybe three custom ski builders in the U.S. that allow customers to work side-by-side with a craftsperson to build their own. He calls this side of his business the "workshops." Making custom skis takes about two and a half days. On the first day, I cut the wood core, created the sidecut (shape), trimmed the base material, glued the edges, profiled the top of the core, and cut the tip and tail sections. On day two, we layed up the skis with epoxy and fiberglass and set them in a jig that creates the camber, or spring. In the afternoon, we put the skis in vacuum-sealed plastic bags and placed them in the oven — a long, insulated compartment equipped with a space heater on a timer. By noon on the third day, we had trimmed the excess material from the sides, filed the edges so they lay flat against the bases, and belt-sanded the tips and tails so they were smooth and symmetrical. I headed home around 12:30 p.m. with new skis in my car. They have a lustrous eucalyptus topsheet etched with my initials. I don't know how all skis are made, but I know how these were. A few days later, I called Whitman with some questions that I was too preoccupied to ask while using power tools. SEVEN DAYS: Did you custom-engineer the trailer for hosting workshops? LARS WHITMAN: The trailer was bare bones, and I had a friend who was in between stuff at the time, so he helped me build it. It was almost a replica of what I had created in the guitar shop. I had the two benches facing each other and just needed storage space underneath, and wherever you can get it. It's kind of like being on a boat: You just have to make things fit wherever they can and get creative with storage. SD: How does guitar building compare to making skis? LW: They're similar in that you have a process, and there are steps you have to take as you go; you have to make sure your attention to detail is accurate at each step, or else it will come back to hurt you later. The guitar was more intense woodworking. You're dealing with smaller parts. You have to steam-bend the wood. There seemed to be a lot more things that can go wrong with guitar making. With ski building, there's a little more leeway. SD: That process hasn't changed much in the last 30 years. How does modern technology play a role in your work? LW: The internet has definitely helped people who like to make things. If you go on Instagram, there's tons of woodworkers who share their tips and tricks, and a lot of makers. That movement has helped my business, for sure. People want to learn how to do stuff with their hands. This one just happens to end with a really cool product that you get to slide around on snow with. SD: Where do your wood cores come from? LW: We get the wood from a mill in Bristol called Lathrop's [Maple Supply]. They source their lumber from local forests. And my friend Jeff Taylor in Cornwall glues the pieces together and cuts them into core material. Right now, we're using poplar and maple. The center is poplar, and then there's two stringers on either side that are maple. Then we just build out poplar from there. If we made an entire ski out of maple, it would be really stiff and heavy. The poplar is a little bit lighter but still has a good strength ratio to its weight. And it's cheaper than maple, too. SD: What motivates people to make skis with you? LW: I think they do it because they're interested in the process, but I think the end goal is to get a pair of skis out of it. I know I've had some feedback from people saying they've been on a lift, and the person next to them will look down and see their skis and ask, "What are those?" And they'll say, "I made these skis myself." I think people get a real charge out of that. SD: At the moment, you're the only person in Vermont who teaches people how to make skis. What draws you to this work? LW: The workshops are becoming more of a major part of my ski building, and I kind of enjoy it more, because you get that interaction with the client. It's a really fun thing to do. The part of building things with your hands is a little bit lost in the world right now, and I think it's starting to come back around. Being able to give people the opportunity to build stuff with their hands, and then use that product for something that's amazing and fun, it's just really rewarding. The original print version of this article was headlined "Bespoke Boards"